West African drums for elementary school music rooms, a yearlong archaeology project to study early Native American cultures of our area, and partnerships to help parents improve relationships with their children are among 24 grants totaling more than $40,000 announced Dec. 4 by the La Crosse Public Education Foundation (LPEF). 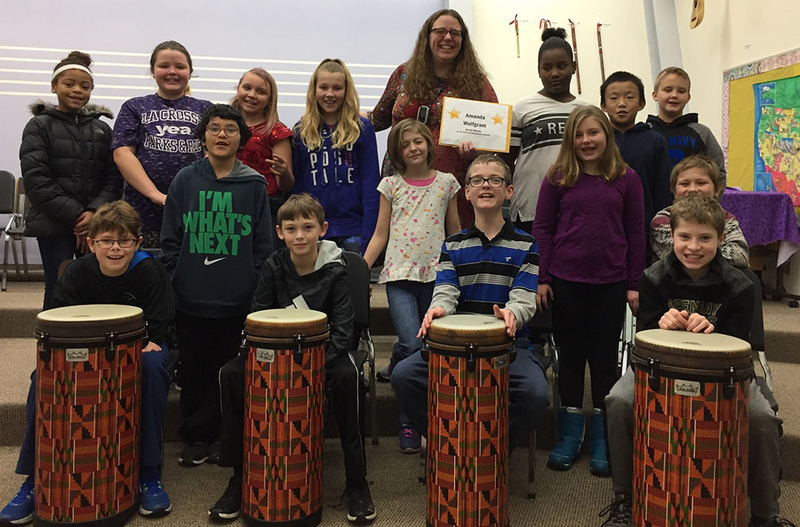 Amanda Wolfgram, music teacher at North Woods International School (center at back) worked with teachers at all elementary schools on a grant request for $4,966 to buy 23 new West African-style drums, and repair drums first purchased with an LPEF grant in 2002. With the new drums, along with those purchased by the district, each elementary school will be able to have their own set of drums, instead of sharing them during the school year. This grant is underwritten by Festival Foods. The 24 grants were chosen from among 39 applications requesting nearly $87,000. Grants are selected for funding based on creativity, ability to engage students and the total impact or reach of the project. This is the first round of LPEF grants for this school year, and almost $40,000 in added grants are expected next spring. The LPEF Board has been aggressively increasing funding for Gold Star Grants. Five years ago, the total awarded was $43,000 and this school year the board has budgeted $80,000 for grants. Corporate Partner in Education – Fowler & Hammer for its long-running support of LPEF and children’s causes in our community. Leadership Award – Dirk Hunter, principal at Summit Environmental Elementary School, for his work to build an innovative and unique school program supported by a strong teaching staff. Margaret Dihlmann-Malzer Distinguished Service Award – Carol Taebel, a retired teacher and community volunteer with a long history of support for LPEF. $5,000 to support training for two educators (along with a third supported by District funding) to enable Logan Middle School to launch a yearlong orientation program helping 6th-grade students with the transition to middle school and a new academic and social structure. The program trains 8th-grade students to be mentors to 6th-graders, leading to increased attendance, reduced disciplinary issues and improved school climate. While new to Logan and the middle-school level, a similar program called Link Crew has been successful at Central High. Recipient: Lisa Buley. This grant is underwritten by Fowler & Hammer. $4,966 to buy 23 new West African-style drums, and repair drums first purchased with LPEF grant money in 2002. With the new drums, along with others purchased by the District in the past several years, there will be enough drums to allow each of the nine elementary schools to have their own set year-round, instead of sharing drums among schools. Recipients: Amanda Wolfgram, Amy Johnson-Pierce, Miranda Campbell, Erin Schockmel, Colin Stiemke, Jill Schams, Karla Wakeen, Jessica Ingvalson. This grant is underwritten by Festival Foods. 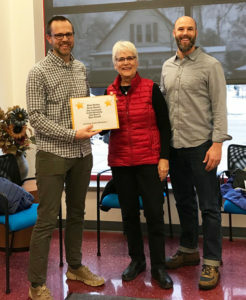 $3,500 to support an artist-in-residence and hands-on art project to educate students at Summit Environmental Elementary, along with members of the community, on the importance of pollinators in Wisconsin. The visiting artist specializes in encaustic painting (molten beeswax paint) and will help students create an art installation simulating a hive structure. Recipient: Carissa Brudos. This grant is underwritten in part by Modern Crane Service. $3,350 to support a yearlong study by Summit Environmental Elementary students of the archaeology process and the earliest Native American cultures of our area. Students will study, conduct shovel testing to identify a potential excavation site on the Summit school grounds, work with UW-L experts on an excavation, process artifacts and report findings. Local experts from the Ho Chunk Nation will demonstrate skills and historical cultural activities. Recipient: Debra Klaeser. This grant is underwritten in part by LHI. $3,000 to support a visiting artist for a weeklong stay to State Road Elementary, teaching students how to draw and working with 5th-grade students to design and paint a school mural. The mural will be based on the school’s “Be Respectful, Be Responsible, Be Safe” theme and will integrate math, reading and writing skills. 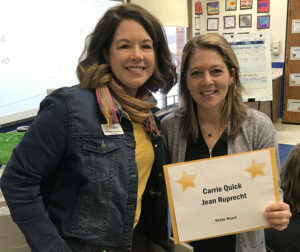 Recipients: Carrie Quick and Jean Ruprecht. This grant is underwritten in part by Trust Point. $2,995 to establish an aquaponics farm to grow plants and fish in a Central High classroom to demonstrate principles of science, agriculture, math and business. The program expects to produce 350-400 heads of lettuce and other vegetables, as well as 32 pounds of fish, all of which can be used in the school nutrition program or donated to families in need. 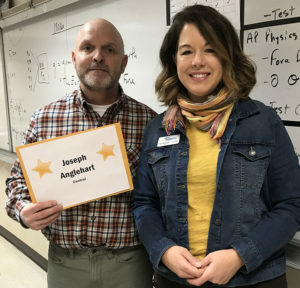 Recipient: Joseph Anglehart. This grant is underwritten by Independent Cycle & ATV. 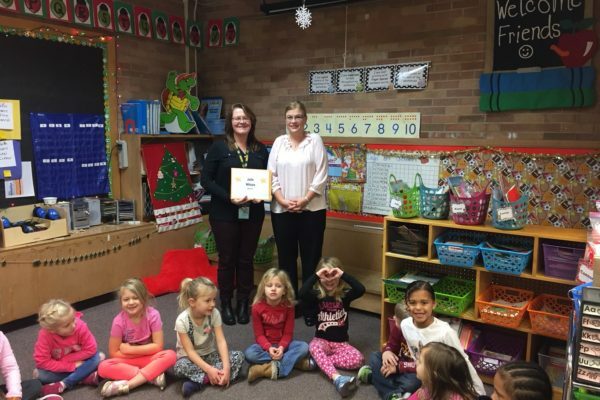 $2,400 to allow Southern Bluffs Elementary to buy several sets of MeMoves videos, a program that incorporates music, rhythm, patterns, repetition, emotion and movement to help students quickly calm and focus attention. The videos have been used successfully to help students get their bodies ready for learning and success in the classroom. Recipients: Leah Aubert and Vivian Storm. This grant is underwritten in part by Dairyland Power Cooperative. Board of Education and LPEF Board Member Brad Quarberg (second from left in front) presents a grant to Steve Johnston at Logan High School. $2,033 to support an effort at Logan High School to invent an energy management system for prosthetic limbs. Logan High is one 15 schools competing in a national program hosted by the Massachusetts Institute of Technology and is using an MIT grant to harvest kinetic energy from human motion to generate and store electricity for prosthetic limbs, rather than requiring them to be plugged in to recharge. LPEF funds will support sending three Logan students to the MIT competition next June, plus will pay costs of filing a patent application for the invention. Recipient: Steve Johnston. This grant is underwritten in part by the LPEF Judy and Randy Eddy Sr. Fund and by Gillette & Associates CPAs. $1,590 to support a partnership with La Crosse County to bring a nine-week parenting class to Spence Elementary. The class helps families who have experienced trauma become better equipped to help children heal and build on their strengths. Recipients: Bree Moore-Lawrence and Shelley Shirel. 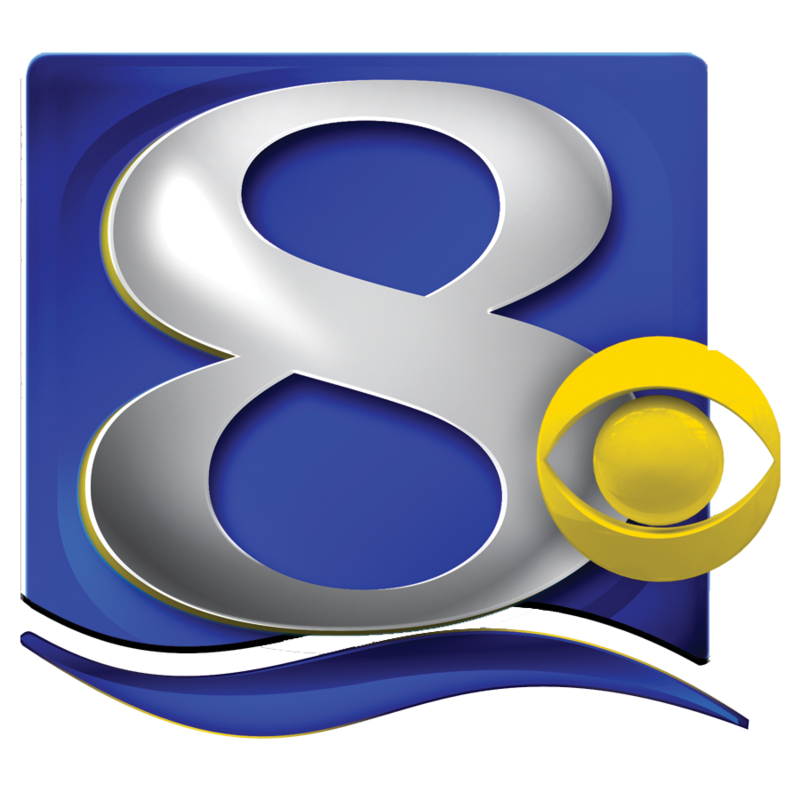 This grant is underwritten in part by Mayo Clinic Health System – Franciscan Healthcare. 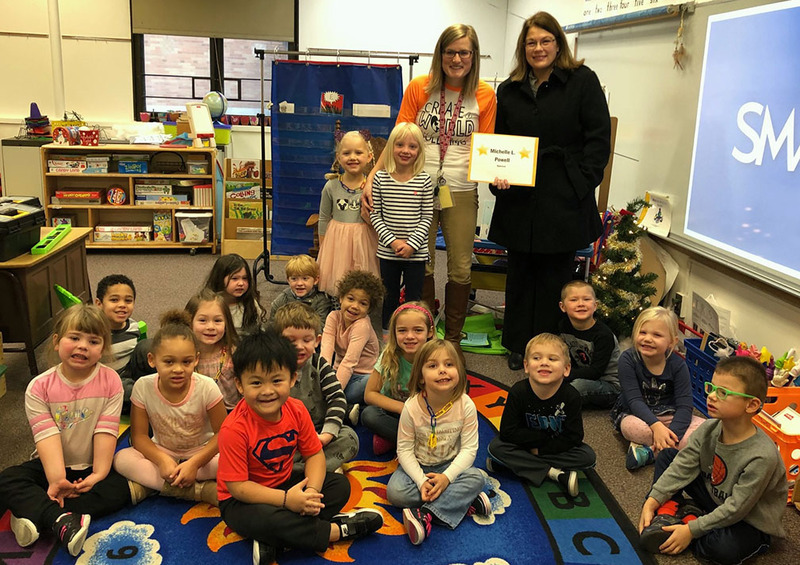 $1,475 to purchase sets of “mentor” books for Southern Bluffs and Spence elementary schools, specific to each grade level, that will help students see themselves as authors in their own right as they compose original stories. Recipients: Jenny Banse and Tami Hillestad. This grant is underwritten in part by Kaplan Professional Education. $1,209 to buy sets of high-interest, leveled books to be used at Logan and Lincoln middle schools as part of an intervention program to help students who are reading at levels significantly below their peers. Recipients: Heidi Jones and Ruth Baardseth. This grant is underwritten in part by Gundersen Health System. $1,045 to buy books that are high interest, but low level, for Southern Bluffs Elementary students who are reading below grade level. 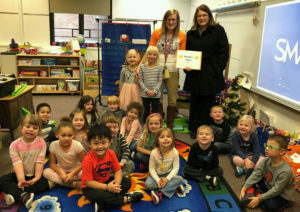 The materials help students with phonics, vocabulary and comprehension without the stigma attached to reading “baby books.” Recipient: Kadie Koepke. This grant is underwritten by Coulee Bank. 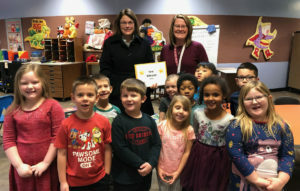 Kindergarten students at Spence Elementary pose with their teacher Michelle L. Powell and LPEF Board Member Tammy Larson. $1,032 to buy 8 Balance Wonder strider bikes and helmets for use by preschool to 1st-grade students at Spence Elementary to help promote gross motor development. Recipient: Michelle L. Powell. 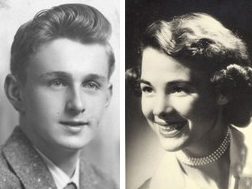 This grant is underwritten by the Duane and Carol Taebel Fund at the La Crosse Community Foundation. $1,000 to buy eight sets of books by contemporary, diverse authors to engage Logan High School students in small group workshops with high-interest texts of their own choosing. Recipient: Anika Paaren-Sdano. This grant is underwritten by the new LPEF Rachel Gundersen Endowment for Arts & Humanities. $944 to support installation of a pollinator garden at Hamilton/SOTA I Elementary as part of a larger effort by GROW to create an “edible schoolyard” landscaping the 7th Street side of the school. Recipient: Jamie O’Neill, GROW. This grant is underwritten by Mooresmiles. 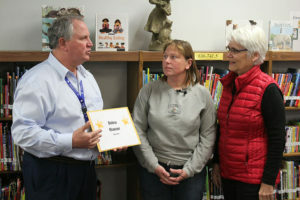 $750 to expand on a previous LPEF grant, providing free books to about 35 Spence Elementary families who receive help through the school food pantry. Children will receive certificates in their food bags, inviting them to select an age-appropriate book of interest to them and their siblings. They will be able to take the book home and keep it to build a home library. Recipients: Dori Bertilson and Deb White. This grant is awarded in memory of Jerry Pilger, a former Spence and Longfellow teacher who passed away in September. $680 to buy specialized display boards and bracelets for staff at Summit Environmental Elementary to use, allowing improved communication with non-verbal students when they are in regular classrooms and other spaces throughout the school. 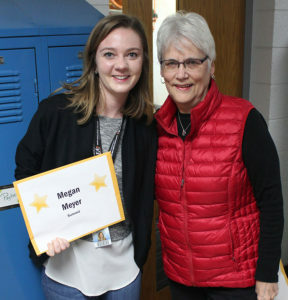 Recipient: Megan Meyer. $610 to provide art supplies for one event, and a hands-on display of snakes and reptiles for another event, in support of a parent group at Northside/Coulee Montessori Elementary hosting Dad’s Nights events aimed at bringing together kids and their dads, or male guardians. Recipients: Parents Brian Merkey, Derek Mueller, Eric Crammond, Justin Reineking, John Duerst, Ryan Cornett. This grant is underwritten by State Bank Financial. $550 to help two 3rd-grade teachers at Hamilton Elementary expand their classroom libraries to purchase quality, leveled, multicultural books where the school’s diverse students can identify with characters and situations. The books also will be available for use by readers in the Readers Creating Readers program funded by anonymous donors to LPEF. Recipients: Carter Semb and Maggie Miller. This grant is underwritten by Mathy Construction. $510 to buy 14 self-contained audio books and companion print books with diverse subject matters for students at Hamilton/SOTA I. The audiobooks improve reading and comprehension skills and introduce students to books above their reading level. Recipient: Carrie Wuensch-Harden. This grant is underwritten by Altra Federal Credit Union. $456 to pay travel costs for a visit to Lincoln Middle School by Judge Kristy Yang of Milwaukee. Judge Yang is the first female Hmong-American to be elected as a judge in the United States. She was born in Laos, lived in a refugee camp and eventually migrated to Wisconsin, where she was educated in public schools. Recipient: Rick Blasing. This grant is underwritten by Wells Fargo. $450 to test use of washable plastic cups and bowls at Hamilton/SOTA I Elementary, reducing the amount of plastic foam bowls and cups being thrown away. Students will learn to reduce waste and reuse whenever possible. The District may save money, providing support to expand the program to other schools. 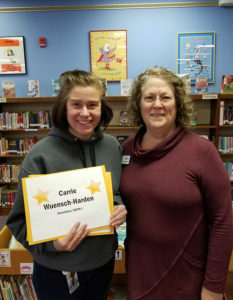 Recipient: Carrie Wuensch-Harden. $428 to buy a set of books to be used with students by a behavior support teacher at Hingten Elementary. The teacher, who has a background in Child Life Specialties, hopes to reach students who are struggling with words to tell how they are feeling by helping them read a story where they can relate to the character or that might otherwise prompt them to open up about their emotions. 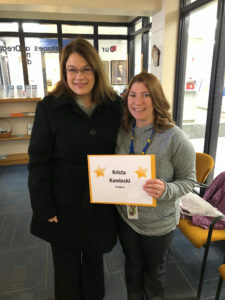 Recipient: Krista Kaminski. 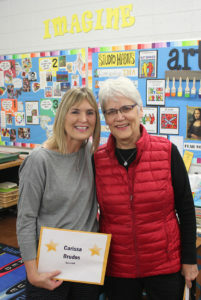 This grant is awarded in honor of Norma Arneson, who retired from the School District last June after 34 years of teaching, most recently as a 2nd Grade teacher at Emerson. Grant support was provided by Fowler & Hammer. $329 to buy a “throwable microphone” called a Qball, along with the necessary wireless speaker, for one State Road Elementary classroom, allowing students with soft voices to be more easily heard in the classroom. Recipient: Lucas Ackerson. 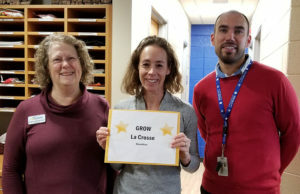 In addition to about $80,000 this school year in Gold Star Grants, LPEF provides other support for La Crosse schools, including more than $29,000 for Random Acts of Kindness to meet needs of students in areas such as nutrition, hygiene, clothing, and transportation. In total, through the support of generous donors, LPEF will provide about $300,000 in aid to the District this year. LPEF’s mission is to enhance learning opportunities for students in the School District of La Crosse and to promote community support for public education. LPEF Board Member Tammy Larson presents a grant to Spence Teacher Julie Wilson, who accepts on behalf of Jenny Banse at Southern Bluffs and Tami Hillestad at Spence. Amanda Wolfgram, music teacher at North Woods International School (center at back) worked with teachers at all elementary schools on a grant request for $4,966 to buy 23 new West African-style drums, and repair drums first purchased with an LPEF grant in 2002. 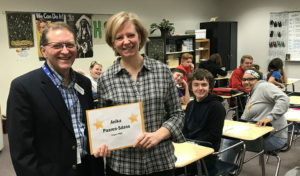 Board of Education and LPEF Board Member Brad Quarberg presents a grant to Anika Paaren-Sdano for $1,000 to buy eight sets of books by contemporary, diverse authors to engage Logan High School students. Bree Moore-Lawrence (left) receives a grant from LPEF Board Member Tammy Larson for $1,590 to support a partnership with La Crosse County to bring a nine-week parenting class to Spence Elementary. Northside Elementary School parents Brian Merkey (left) and Derek Mueller (right) receive a grant from LPEF Board Member Kathie Tyser for $610 for Dads’ Nights at Northside. 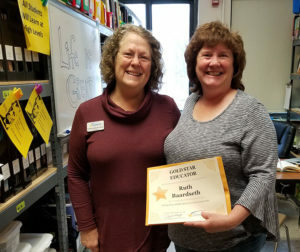 Summit Environmental Elementary Teacher Carissa Brudos with LPEF Board Member Kathie Tyser: Carissa received a $3,500 grant to support an artist-in-residence and hands-on art project to educate students at Summit Environmental Elementary. Carissa Brudos shares news of her grant with students in her art class at Summit Environmental Elementary School. LPEF Board Member Cari Mathwig Ramseier presents a grant to Carrie Quick for $3,000 to support a visiting artist for a weeklong stay to State Road Elementary. Carrie Wuensch-Harden at Hamilton/SOTA I received two grants from LPEF Board Member Margaret Dihlmann-Malzer. Hamilton teachers Carter Semb (left) and Maggie Miller (right) are presented a grant by LPEF Board Member Margaret Dihlmann-Malzer. 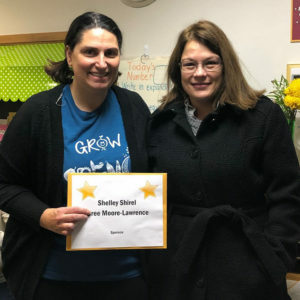 Spence Teacher Dori Bertilson receives a grant from LPEF Board Member Tammy Larson for $750 to expand on a previous LPEF grant, providing free books to about 35 Spence Elementary families who receive help through the school food pantry. 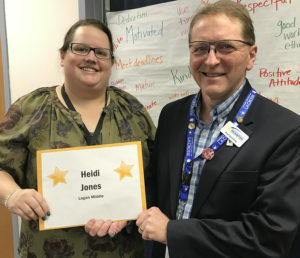 Heidi Jones of Logan Middle School is presented a grant by LPEF Board Member Brad Quarberg for $1,209 to buy sets of high-interest, leveled books to be used at Logan and Lincoln middle schools. LPEF Board Member Margaret Dihlmann-Malzer presents a grant to Ruth Baardseth at Lincoln Middle School for $1,209 to buy sets of high-interest, leveled books to be used at Logan and Lincoln middle schools. Central High Teacher Joe Anglehart is joined by LPEF Board Member Cari Mathwig Ramseier as he receives a grant for $2,995 to establish an aquaponics farm to grow plants and fish in a Central High classroom to demonstrate principles of science, agriculture, math and business. 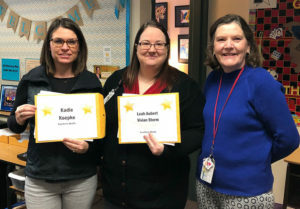 Southern Bluffs teachers Kadie Koepke, Leah Aubert and Vivian Storm received grants from LPEF. 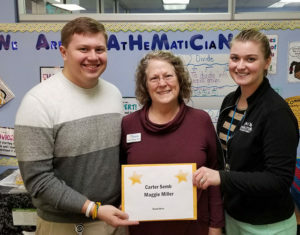 Kadie’s grant for $1,045 is to buy books that are high interest, but low level, for Southern Bluffs Elementary students who are reading below grade level. 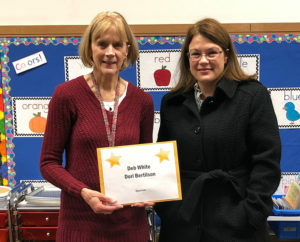 Leah and Vivian received a grant for $2,400 to allow Southern Bluffs Elementary to buy several sets of MeMoves videos. LPEF Board Member Tammy Larson presents a grant to Krista Kaminski for $428 to buy a set of books to be used in therapy sessions by a behavior support teacher at Hingten Elementary. Logan Middle School’s Lisa Buley receives a grant from LPEF Board Member Brad Quarberg for $5,000 to support training for educators at Logan Middle School to launch a yearlong orientation program helping 6th-grade students with the transition to middle school and a new academic and social structure. 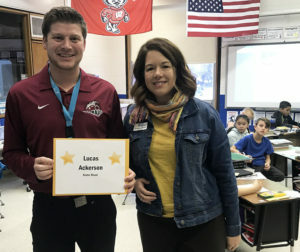 State Road Teacher Lucas Ackerson receives a grant from LPEF Board Member Cari Mathwig Ramseier for $329 to buy a “throwable microphone” called a Qball, along with the necessary wireless speaker, for his classroom. Jamie O’Neill of GROW (center) is joined by Hamilton Principal Ben Burns (right) and LPEF Board Member Margaret Dihlmann-Malzer. GROW received a grant for $944 to support installation of a pollinator garden at Hamilton/SOTA I Elementary as part of a larger effort by GROW to create an “edible schoolyard” landscaping the 7th Street side of the school. Megan Meyer at Summit is joined by LPEF Board Member Kathie Tyser who presented a grant for $680 to buy specialized display boards and bracelets for staff at Summit Environmental Elementary to use, allowing improved communication with non-verbal students when they are in regular classrooms and other spaces throughout the school. 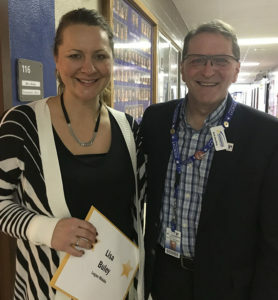 Rick Blasing of Lincoln Middle School was presented a grant by LPEF Board Member Margaret Dihlmann-Malzer for $456 to pay travel costs for a visit to Lincoln Middle School by Judge Kristy Yang of Milwaukee. Summit Environmental Elementary Principal Dirk Hunter (left) is joined by Jean Dowiasch of the Mississippi Valley Archaeology Center and LPEF Board Member Kathie Tyser. 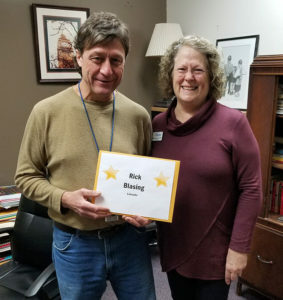 Dirk accepted a grant on behalf of teacher Debra Klaeser for $3,350 to support a yearlong study by Summit Environmental Elementary students of the archaeology process and the earliest Native American cultures of our area.